Highlighted by the discovery of a WW2 bomb during Freshers week, the shadow of Coventry’s ‘darkest hour’ still hangs over the city. 75 years ago, on November 14th 1940, over 30,000 incendiary bombs struck Coventry in a terrifying eleven-hour onslaught. Broadgate in Coventry city centre following the Coventry Blitz of 14/15 November 1940. Officially called ‘Operation moonlight sonata’ but known locally as ‘The blitz’, the air raid was indiscriminate and caused mass damage to the city, destroying landmarks and homes and killing hundreds of innocent citizens. Children searching for books among the ruins of their school in Coventry after a night raid, 10 April 1941. It may seem odd that such an event is ‘celebrated’, but Coventry is extremely proud of its recovery from the blitz, and the subsequent attacks on the city. Our history includes many inspirational stories, each documenting the camaraderie, support and forgiveness shown by Coventry’s citizens – even in the face of such destruction and loss. 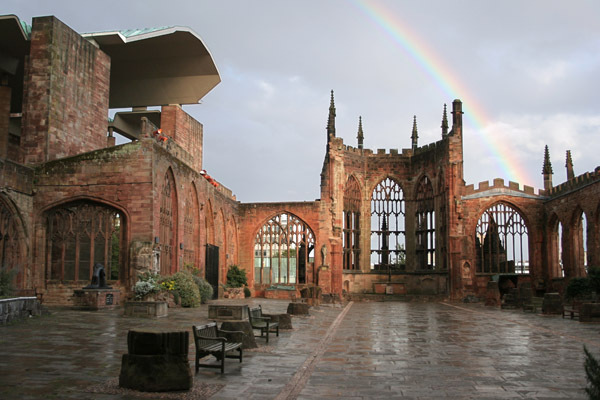 The legacy of Coventry as a ‘city of peace and reconciliation’ began that year, when the Provost of the cathedral urged people not to seek revenge, but to forgive, not only the Germans, but all humanity for the scourge of war. Take part in a full day of workshops and experiences to commemorate the anniversary of the Coventry Blitz. The Friends of the Park invite you to join them for an afternoon of song and companionship in the Visitor Centre. Tea and biscuits provided. Mozart Requiem brought to you by St Michael’s Singers, English Symphony Orchestra and the Parliament Choir. The Lord Mayor invites Coventry Blitz survivors to help remember and reflect on an important milestone for the city. Lunch is available and nostalgic music will be performed by Sara Spade. 1pm – 3pm St Mary’s Guildhall. If you would like a free ticket please contact the Lord Mayor’s office on 024 7683 3100 or via e-mail. Join the Lord Mayor and Bishop of Coventry for a special Civic Service of Commemoration to mark the 75th anniversary of the bombing of Coventry. 7pm Coventry Cathedral, please be seated by 6.45pm. To find out more contact Lord Mayor’s office on 024 7683 3100 or via e-mail. Events, Explore The City, Get Involved!